The trajectory of Krista Patronick’s life would be wildly different had she not decided to attend UMass Lowell. If Patronick had never spent four formative years at UMass Lowell, the newly-minted director of women’s hockey operations at Dartmouth College most likely would never have gone into a career in hockey. Somewhere in those four years, covering men’s hockey at the Tsongas Center for The Connector, Patronick found something beautiful in the chill of the rink. She looks back now, after several years’ worth of experience working in some capacity in women’s hockey, with a sense of gratitude that she found her purpose in Lowell. Although her career trajectory has been far from linear after graduating from UMass Lowell, she says that it guided her to where she eventually ended up. Patronick says that her time on The Connector proved integral to her personal and professional development. As Editor-in-Chief, Patronick says that she learned the management skills which would aid her in her career. Although all the people on her staff were different in their working styles, she needed to bring them together towards a common goal: publishing a weekly paper for the UMass Lowell community. Patronick carried those missteps from the Connector to freelance journalism jobs and then eventually to The Hockey Academy, where she says that she worked for several junior hockey teams’ social media, websites and video production. The change to working directly with hockey teams invigorated not only her interest in the sport but in staying around it in a professional context. “It made me realize that being on a team is something special. But it’s also more than that – the person you work with every day at the rink or the person sitting next to you in the locker room – that is your family,” she said. Being involved with teams behind the scenes in a media context inspired her to take her love of hockey even further. After graduating from her sports management graduate program at Southern New Hampshire University, she looked for opportunities in hockey operations. Patronick played an integral role in the development of the Boston Blades, a franchise of the Canadian Women’s Hockey League. She served as general manager from 2015-2017 and delighted in managing day to day operations of the team as well as the opportunity to interact with some of women’s hockey’s most storied players. “When I brought it there to get it fixed, the whole time I was thinking… ‘Do they even know whose skate they’re touching?’” she said. Those two years spent at the helm of a professional women’s hockey franchise were essential to Patronick’s career development, but she could not resist a call to work for a college hockey team. 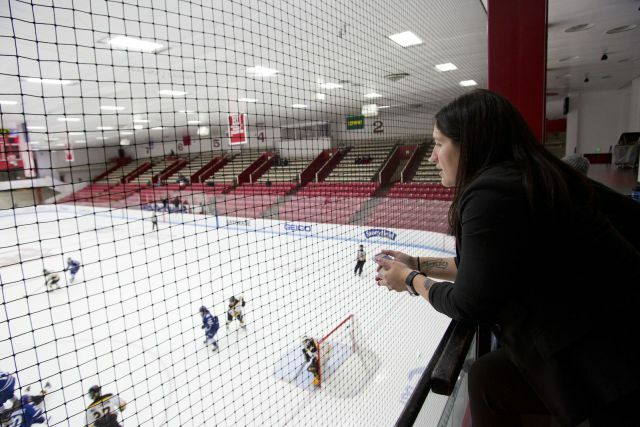 When Colgate University reached out to Patronick offering her a position as director of hockey operations for their women’s team, Patronick leapt at the chance. Last season, Patronick helped lead Colgate to their first Frozen Four appearance. The Raiders finished with a 34-6-1 overall record and lost the NCAA Championship game to Clarkson in a 2-1 overtime loss. Although it was a heartbreaking loss for both Patronick and the team, she learned more about the position and looks to accomplish even greater feats at Dartmouth. “I have a lot of goals for what I’d like to bring to Dartmouth, improving the team’s social media, video [etc.] I have a bunch of creative initiatives I’d like to take on,” said Patronick. Beyond next season, however, Patronick does not count out any other career opportunities. All she knows is that she hopes to stay in a team environment and produce a winning atmosphere, enjoying the victories and hardships along the way. “I’m not too sure where my career will take me, but I hope wherever I am that I can be an important fiber of a team and make a positive impact on them,” said Patronick. She knows she likes college hockey though, and the sport should consider itself lucky to have her. The person she is today, with all that hockey experience under her belt, is decidedly different than the frustrated music major that enrolled in UMass Lowell for the 2005 school year. Even through the different career adjustments that she has made, hockey rinks have always inspired her, and UMass Lowell will always be the place that sparked it.